New! The Educational Allies Award celebrates a person who makes a positive impact in their school or community. 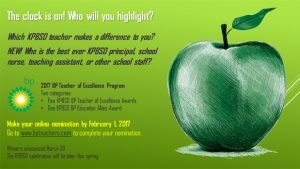 Nominate anyone from a principal, to a school nurse, custodian, secretary, student nutrition (lunch room) or teaching assistant. Do you know an unsung hero? Share their story with BP here. Since 1995, BP has worked with Alaska communities to honor exceptional Alaskan teachers through the BP Teachers of Excellence program. In the past 19 years, hundreds of teachers have been chosen as BP Teachers of Excellence. 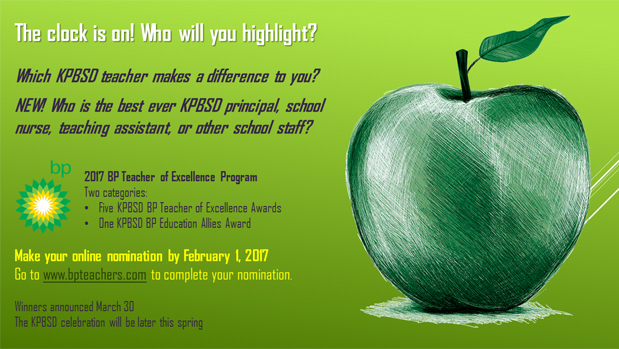 Each BP Teacher of Excellence receives a $500 gift card and an award certificate. An additional $500 will also be awarded to the winner’s school or PTA group. Each Teacher of Excellence is automatically eligible for the BP Teacher of the Year award.